We decided to bivy out in the Needles rather than commute the 3 miles each way every day. 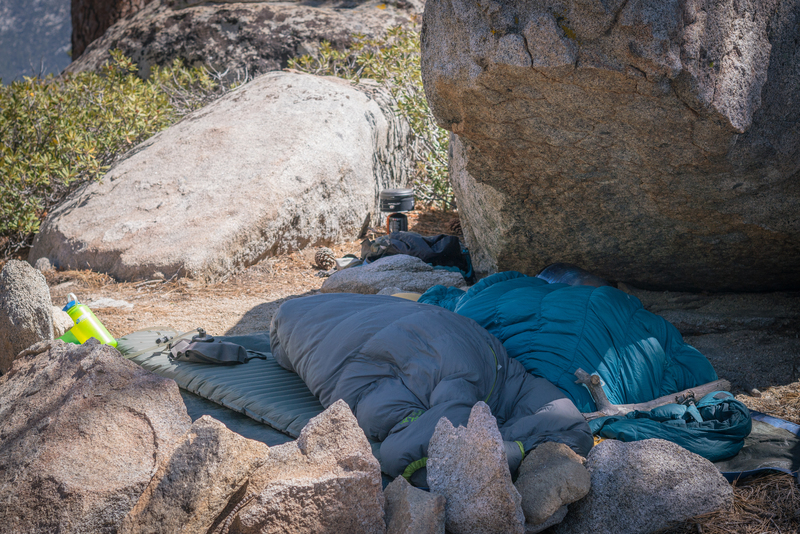 Most people stash their gear at Main Notch, but we would be over an hour ahead of every party by sleeping out on the saddle. Our limiting factor was water. I drastically underestimated how much water I drank in the SoCal desert. Going through 3 liters minimum a day wouldn’t even be enough to urinate. Our first climb we got on was White Punks on Dope, next to the unprogresssively named Black Dude on Welfare. 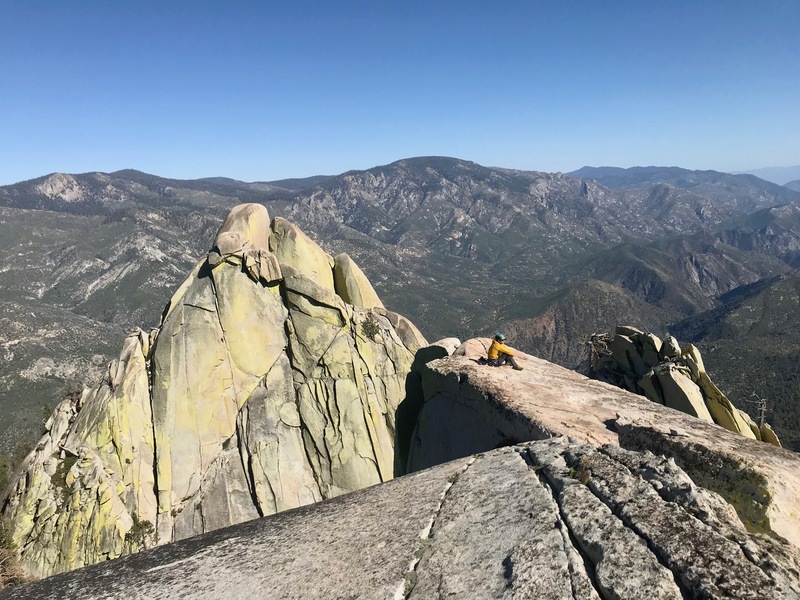 ….. Having cruised through 800 ft of climbing and eaten two hummus-pepper wraps we decided to hop on the South Face of the Warlock. Described as an adventure route, I had no idea that I would be doing off-width and stemming moves for the next 900 ft. I jammed my knee a little too hard on some of my leads and it became a sensitive, torn up, pulp for the next week. Will led the 10+ finger variation and I pulled my nails away from their fleshy attached skin as I frantically jammed my fingers into disappearing, steep fingers. I took several full falls on follow before I desperately aided up past some hard moves. I was destroyed and exhausted. 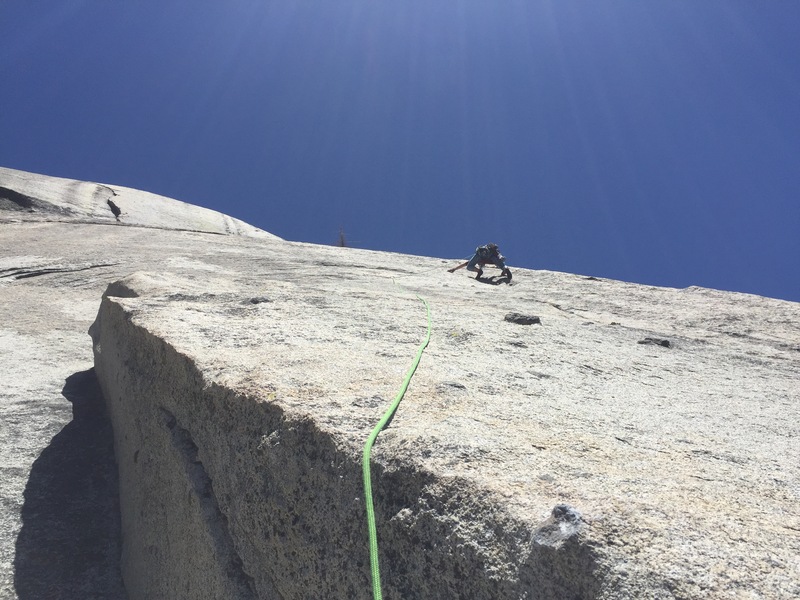 Topping out meant climbing to the middle summit, rapping into a notch, aiding up a bolt ladder to true summit for the two full lengths 70m rappels to the base. Those hard falls being ripped out of the crack and 1600 ft of climbing apparently was enough to rip the toe caps off my climbing shoes, exposing the leather and rand underneath on our first day of the trip. Well, I guess I’ll have to press harder into my toe! Our first night out in The Needles was wonderful. We were completely alone with the stars and the chirping bats. 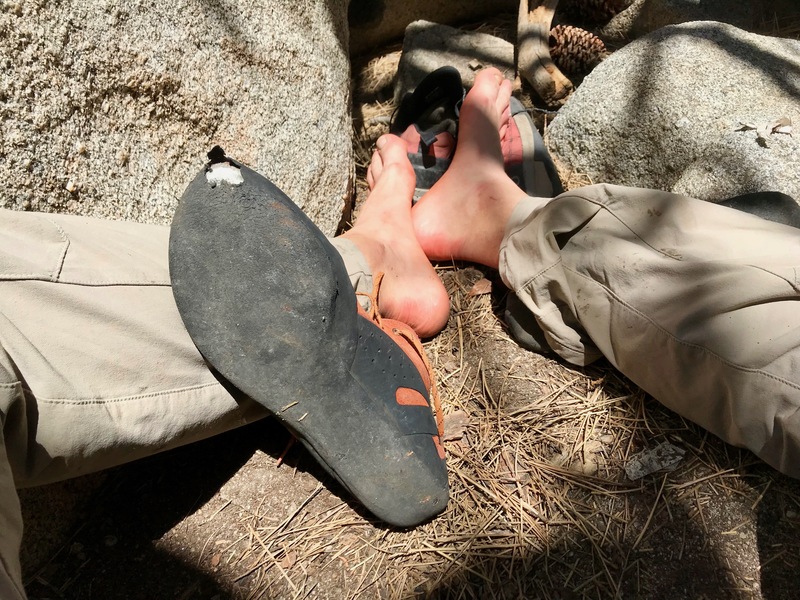 In classic California fashion, a campfire sprang to life with less effort than scuffing a shoe with the tinderbox-dry wood. Light and warmth from the fire, beautiful stars and some bourbon kept us up until 11pm in high spirits. The next day we woke at 7am and while sipping Mate, were surprised to find a single party huffing past our bivy down the ridge. All we heard was they started at 6am before they were sprinting past us. Luckily, we would remain the only party down the Main Notch as we started the classic 5.9+ Igor Unchained at 9am. Sprinting to the top in just two hours, we rappelled down The Witch (with a short down climb) and were back at the base starting up 5.10a Airy Interlude by 11:30am. 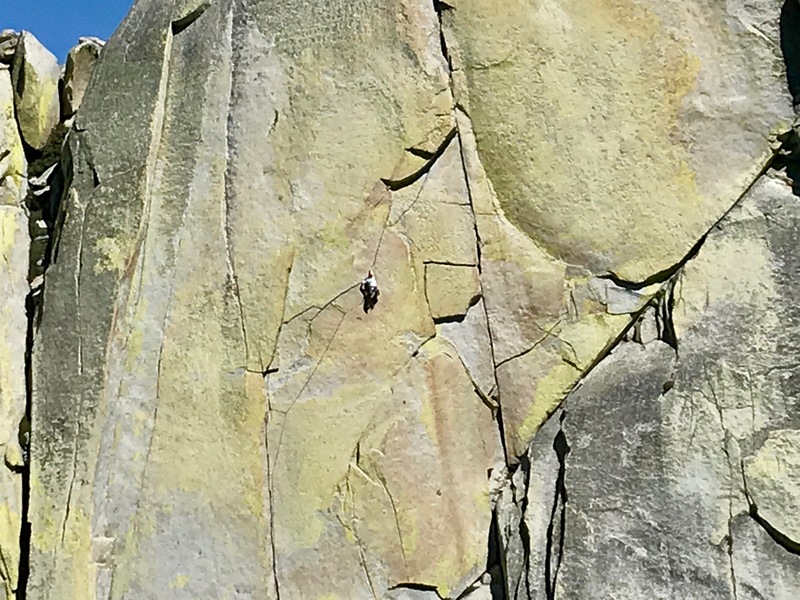 The 10a pitch was amazing and stiff (as most things felt here) in a right shooting finger crack traverse. The move to mantel onto the crack at the end was heady with a hand jam, but wild for me given my hand didn’t fit! Just before the mantel up and out of the traversing crack. Finally, we got on Fancy Free 10b with a long undercling section around an alcove, followed by a wide crack section to the 10b money pitch. 10b is typically doable for me, but the fingers again became small enough to split my nails and I took one follower fall before reaching anchors. Possibly because I had no remaining rubber on the front part of my right shoe. At belay, a fighter jet rocketed past the Witch across the gulley, blasting of us with booming thrust. The jets were a regular appearance, but this one passed close enough for an extremely good view. We had planned on four days, but I was really beat up and tired by day three. 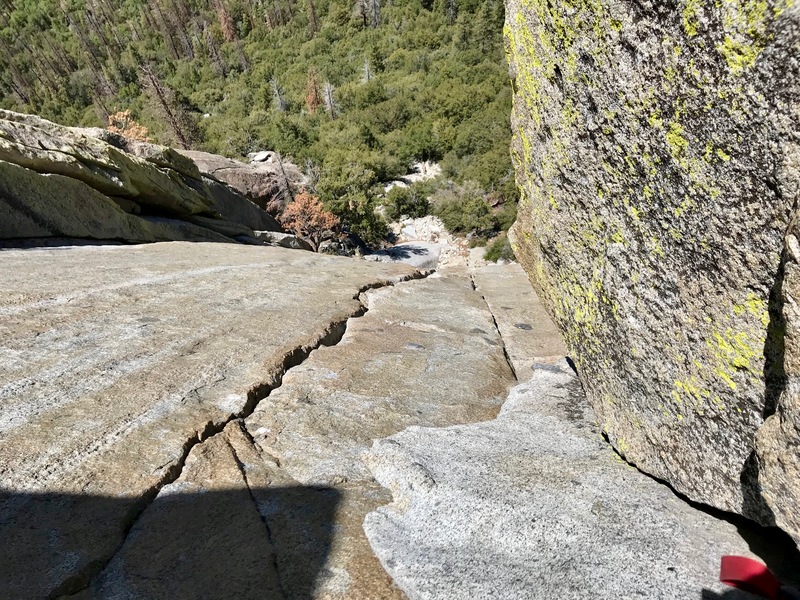 We hoped on 5.9 Imaginary Voyage with me exhausted and sweating in the intense sun up what was supposed to be a splitter hand crack, but was more like a broken crack with many sections fist or wider. 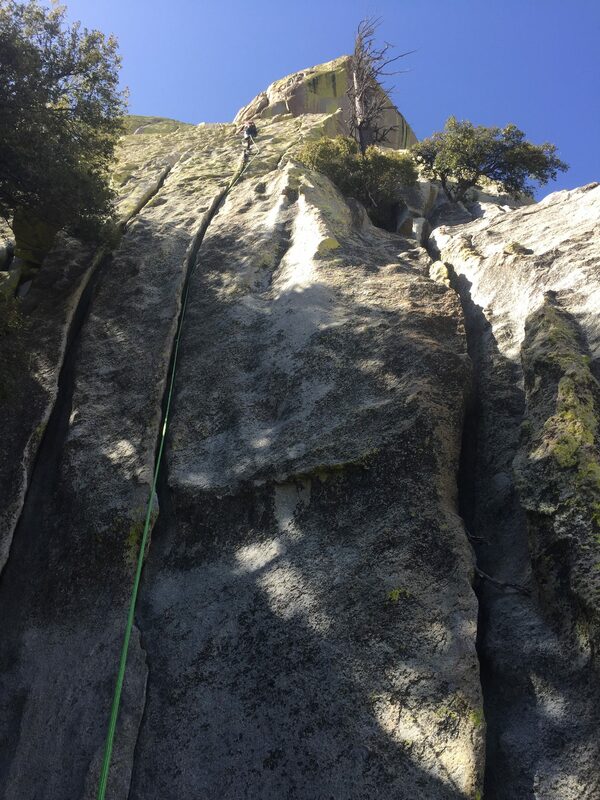 It was a good fun climb with a heady transition from crack to slab as well as a gaping chimney / off-width / roof that makes you want to run for momma until you realize you can stem around it. The morning’s climb had sufficiently worn my right shoe tip down to the rubber, the threads keeping the internal shoe together were hanging out of the opening. Will with his superior technique was still in great spirits and ready to hop on Thin Ice 5.10, but I was already Type 2 climbing. Every time I bumped my beat up fingers against the rock, pain struck my brain like a lightning bolt. My knees were ready to break open their abrasions into faucets of blood and sparks of hurt if we got into any more serious off-width. My legs begged for a rest and I felt sick with a body with too much inflammation and sending every indicator to take it easy. Will thoughtfully took mercy and opened the door to leaving early which I filled with a resounding yes. The Needles for me felt harder than normal for grade, but had great high quality crack systems and was not nearly as scary or unprotected as people had said. The standard Needles rack was double to 3” with a set of offsets and stoppers. More often than not we were thankful for bringing the #4 on every climb. Bivying out there was peaceful and awesome, but the limiting factor was water. We had to resupply the second night after having gone through 3.5 L each per day. Definitely worth the visit when I’m a better, stronger, 5.10 climber.